Congratulations to the 2012 ENnies nominees. Thank you to the judges for their exhausting and oft thankless task! 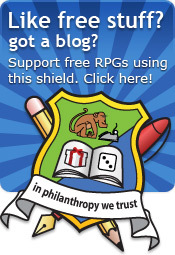 None of the the nominations in the Free RPG category are by philanthropists. They are all cut down marketing versions of commercial games. The ENnies are about showcasing the best of the hobby and I feel that philanthropy, which has been a part of the hobby since it began, is not being represented here. All the games are free in that category. They all belong there. The judges believe en masse that quick starts and previews are more worthy than the free games submitted. We don't have review criteria for the free RPGs category as the judges are left to decide on their own. Judging is hard work as it is without having to solicit feedback about whether X was chosen over Y. There are no guidelines for judging a free RPG so all the judges have is the category title. Justin submitted Heroes Against Darkness this year and suffering sour grapes for not getting a nomination. I can understand his frustration. We don't need another set of awards to showcase the work of philanthropists, the ENnies is the correct place for that. There will, no doubt be the Golden Banana, which will be funded by 1km1kt T-Shirt sales (coming soon). If anything the Golden Banana should be part of the Ennies, or at least complement it. I would be ill-suited for judging commercial products because I don't play them. I only play free ones. I only review free ones. I only read free ones. I doubt being a judge for a single category is very useful at all. An opaque box. Tony Law has demonstrated that he's open to ideas, thoughts, feedback and wants to pro-actively find a solution. Either the category needs caveats attached to it, i.e. that commercial marketing quick starts should be given less credence than a full game; or there needs to be a new category that represents the vast amount of philanthropic output each year. As Tony (and others) rightly point out on Google Plus you need to keep it broad to allow the crazy free stuff equal share with the full game systems. Naming the category appears to be key in getting the philanthropic goods in there. Once we have the category sorted out, we then need to galvanise the philanthropists for next year. Without submissions, this process is a bit moot and we might as well leave it to the industry. Philanthropy is a separate beast to Indie. A niche of it but Indie also encompasses those that see PDFs for free and would include Quickstarts of Paid-For Indie products. Philanthropy is about putting your heart into something and then giving it to the world for the love of it. It is not a marketing tool. How do we make this work? How do we help the ENnies showcase the best of free next year? Surely, with our collective grey matter and Tony Law's help, we can solve this! If you're a philanthropist and you're feeling disenfranchised then that's OK, it's understandable. But we can change it for next year. We can get representation for the work we do. We can applaud the best philanthropy in our hobby. It is worth it. It can be done. My comment on Google Plus with Tony Law's excellent feedback. Know of any more articles or comment? Post in the comments and I'll add you up. Seems to me like the categories should be "Best Free Teaser or Supplement to a Commercial Game" and "Best Free Game or Supplement to a Free Game"
That's a good shout, Joshua, thank you! Miguel, thank you for the comment. That's a valid point. I do try and market them. What I hope to do is keep building up awareness of free RPGs by reviewing them, tweeting about them, Google+ing them so that people are sick of me! I gave some handy free marketing tips on my guide to organising a free RPG. When it comes to nominations for the ENnies, the authors submit the games to the judges, who then judge them to pick nominees. So, it's more up to the authors to submit, rather than the judges to know about the free games. Now I wish I would have written something more, I don't know, insightful? I'll throw out this idea and maybe it'll be useful, maybe it won't. What about a "low to no budget" category. It describes the game and the players. :) Maybe there's a better way of expressing that. If anything a new category is going to have to use exactly the right verbiage so it will have the desired message and will be acceptable to the Ennies. Hey Emmett, thanks for the comment. I liked your blog post as it mirrored the way many of the philanthropists felt. As a hot-headed member of that odd group, I know all too well to write the angry blog post and then delete it the next morning! Low-To-No Budget sounds like a great idea. There will always be exceptions and we're looking at a category that covers the majority of games. The game that jumps to mind that breaks Low-To-No is Dog Town, whose author spent a fair bit on graphics but realised on completion that it wasn't going to sell well (without big further investment) so gave it away for free. To be fair, the vast majority of games (mine and yours for a start) fit that description, so it's a good idea. "Play not Pay" I love that shirt. I so want one. Too bad I have no money :( aww sadness. Rob Lang is a British programmer with a PhD in Cybernetics who started gaming when he discovered his local game store at the age of 9. In 1990, Rob started roleplaying by writing his own game, Icar, which went online in 1996 and has been free to download ever since. Rob is an admin at the free RPG Community 1KM1KT. In 2009, Rob and 1KM1KT ran a 24 Hour rpg Competition, which was a roaring success. Rob is also collating a Directory of free RPGs. Find me online: brainwiped@gmail.com, Twitter, Delicious, deviantArt, steam and around the net as 'brainwipe'.